at the ONE Gallery, West Hollywood, located at 626 North Roberton Boulevard. 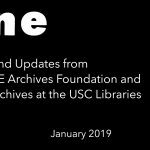 West Hollywood, CA — The ONE Archives Foundation, Inc. is pleased to announce The Gutter Art of Stephen Varble: Genderqueer Performance Art in the 1970s, photographs by Greg Day. Curated by David J. Getsy, Professor at the School of the Art Institute of Chicago, the exhibition brings to light the work of performance artist Stephen Varble (1946–1984) through the photographs taken by Greg Day (b.1944) of his costumes, performances, and collaborations. In costumes made from street trash, food waste, and stolen objects, Stephen Varble took to the streets of 1970s New York City to perform his “Gutter Art.” With disruption as his aim, he led uninvited costumed tours through the galleries of SoHo, occupied Fifth Avenue gutters, and burst into banks and boutiques in his gender-confounding ensembles. Varble made the recombination of signs for gender a central theme in his increasingly outrageous costumes and performances. While maintaining he/him as his pronouns, Varble performed gender as an open question in both his life and his work, sometimes identifying as a female persona, Marie Debris, and sometimes playing up his appearance as a gay man. Only later would the term “genderqueer” emerge to describe the kind of self-made, non-binary gender options that Varble adopted throughout his life and in his disruptions of the 1970s art world. At the pinnacle moment of Varble’s public performances, the photographer Greg Day captured the inventiveness and energy of his genderqueer costume confrontations. Trained as an artist and anthropologist and with a keen eye for documenting ephemeral culture as it flourished, Day took hundreds of photographs of Varble’s trash couture, public performances, and events in 1975 and 1976. Varble understood the importance of photographers, and Day was his most important photographic collaborator. This exhibition brings together a selection of Day’s photographs of Varble performing his costume works and also includes Day’s photographs of Varble’s friends and collaborators such as Peter Hujar, Jimmy DeSana, Shibata Atsuko, Agosto Machado, and Warhol stars Jackie Curtis, Taylor Mead, and Mario Montez. Varble sought to make a place for himself outside of art’s institutions and mainstream cultures, all the while critiquing them both. The story of Varble told through Day’s photographs is both about their synergistic artistic friendship and about the queer networks and communities that made such an anti-institutional and genderqueer practice imaginable. Together, Varble and Day worked to preserve the radical potential of Gutter Art for the future. The Gutter Art of Stephen Varble builds upon the 2018 retrospective exhibition of Stephen Varble’s work at the Leslie-Lohman Museum of Gay and Lesbian Art, New York, titled Rubbish and Dreams: The Genderqueer Performance Art of Stephen Varble, as featured in the New York Times on January 11, 2019. The new ONE Gallery exhibition, with its focus on the collaboration of Varble with the photographer Greg Day, will explore the ways in which Varble’s disruptive guerilla performance art has lived on primarily through vibrant photographs that captured his inventive costumes, transformed trash, and public confrontations. The Gutter Art of Stephen Varble: Genderqueer Performance Art in the 1970s, photographs by Greg Day is organized by the ONE Archives Foundation, Inc. The ONE Archives Foundation, Inc. is an independent 501(c)(3) dedicated to telling the accurate and authentic stories of LGBTQ people, history, and culture through public exhibitions, educational projects, and trainings, and community outreach programs. Our exhibitions, school programs, and community outreach programs are free. We depend entirely on members of the public and private foundations for support. For more information, please reach us at www.ONEArchives.org.